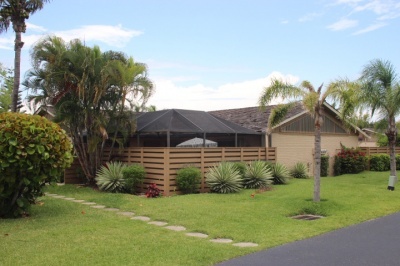 Oceanside Terrace is a small gated community located at 1801 S. US Highway 1 just a short walk to the beaches here in Jupiter. 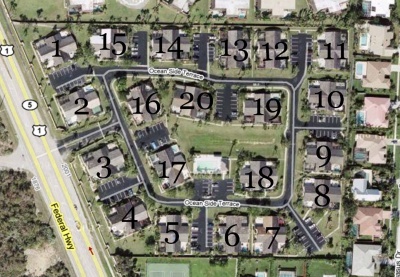 They are one of just a few single story townhomes here in Jupiter. They feature large fenced courtyards which are great for grilling or storing kayaks and/or bikes. Oceanside Terrace has only 64 townhomes in the community. The beachfront community features a pool with the covered area to relax and shade. You will love the one story split bedroom plan with vaulted ceilings.They are 2bd/2ba with 1,100 sq. ft but seem much larger due to the vaulted ceilings. Each unit gets 2 assigned parking spaces and 25lb pets are allowed. Oceanside Terrace is one of my favorite beach condos. Just a short bike ride to the beaches of Jupiter make Oceanside Terrace a popular beachfront community here in Jupiter. Walk out your gated community and you will find the entrance to the Jupiter Riverwalk which is a several mile long boardwalk along the Intracoastal Waterway. You will walk past several Jupiter condos including the Jupiter Yacht Club which has it's own marina and maybe stop and enjoy a drink at the Dive Bar. Past there is the new Jupiter Harbouside Plaza which has several restaurants, shopping and a wondeful hotel. Don't forget Jupiter Ocean & Racquet Club is next door where you can join the tennis club and pool. The area between US 1 and the beach has some wonderful beachside communities that offer a close proximity to the beach at relatively bargain pricing. Many of the communities can be purchased at just over $250,000. The older communities offer lush grounds with plenty of lawn space between the buildings. The whole stretch along here offers many townhome style communities for those not looking for the typical condo style living. Many young people as well as retirees flock to these older beach communities that are well-maintained due to the proximity to beaches and other Jupiter activities. The West side of US 1 features newer communities and high-end rentals that start at $750,000 or more. This area of affordable Jupiter beachfront condos has always been a favorite of mine. Call us to show you the beach communities here in Jupiter. Call me to show you other beachfront communities such as Singer Island condos or Hutchinson Island condos which both offer more alternatives and a different lifestyle. If a beachfront Condo listing has caught your eye or you want more information about Jupiter, FL real estate, please don't hesitate to call 1-561-744-7025, or email via our handy contact form with any questions or to arrange a showing.